This recipe illustrates the influence of the Pacific Rim on San Franciscan cuisine. Here, we've marinated cubes of boneless chicken breasts in an Asian-style marinade, then thread them onto skewers with snow peas and cherry tomatoes. After grilling, serve over our slaw, a crunchy mix of cabbage, bean sprouts and daikon (Japanese radish). In a medium bowl, whisk together the marinade ingredients. Set aside. Remove and discard any visible fat from the chicken. Rinse and pat dry. Cut into 1/2-inch cubes. Place in the marinade, cover and refrigerate for at least 30 minutes or up to 2 hours. If using wooden rather than metal skewers, soak them in warm water for 30 minutes to prevent burning. Light a grill, or preheat the broiler. Blanch the snow peas in boiling water and cover for 1 minute. Drain. Thread the chicken cubes, snow peas and cherry tomatoes onto the 4 skewers. 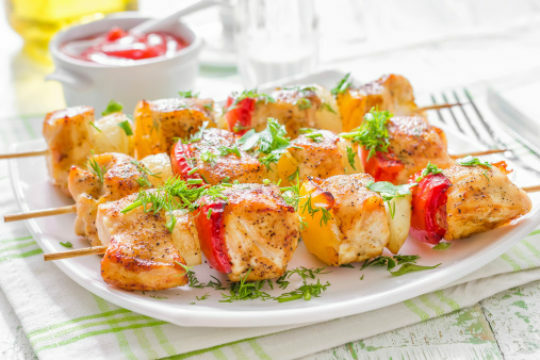 Serve at once as a bed for the grilled chicken skewers. Each chicken skewer and Asian slaw recipe produces 4 servings. Baker's Tip: Hoisin sauce is a sweet, spicy sauce sold in the Asian food section of most large supermarkets and Asian markets. You can substitute tomato-based chili sauce with good results.